RY (Festival of India) Launch Party - Sun, June 26th ~ The Toronto Hare Krishna Temple! Festival of India (Ratha-Yatra) Launch Party! To kick off the official countdown to the 44th Annual Festival of India, a special day-long launch party will be held at Yonge-Dundas Square. The festival will include a cavalcade of activities, attractions and performances, including live art, vegetarian cooking demonstrations, free yoga classes, a South Asian bazaar, delicious food from Govinda’s, henna tattoos, face-painting, dress-in-a-saree booths, and more. 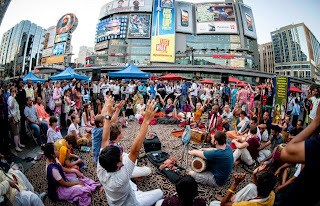 Also, be sure to stay until the evening to participate in an incredible, interactive mantra concert (kirtan) in which ancient sounds from the east will reverberate and grace Toronto’s busiest corner!